In 2001, the remains of the old Ribera neighbourhood appeared inside the market: they corresponded to the area Philip V had raised to the ground following the Catalan defeat in 1714, and which had been buried since that time. 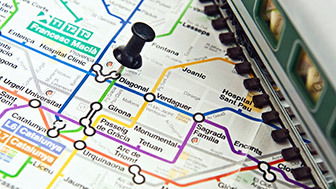 The find was the starting point of the El Born Centre de Cultura i Memòria, mainly set up to study, preserve and exhibit the remains to the public. The Born opened in 1876 as a municipal market and was one of the first buildings in Barcelona built with an exposed iron framework, following the European trend at the time. Little did anyone suspect then that underneath the new construction there lay hidden an archaeological site of great historical significance for the city. Taking his inspiration from Les Halles in Paris, the architect Josep Fontserè designed a tall, open, functional space, which stood out for its metal structure, central dome and glazed-tile roof. In 1921 it became the central wholesale market, which operated until 1971 and was restored in 1977, although it was no longer in use. At the end of 2001, while work was being carried out on the site to house the Provincial Library, the remains of houses that had formed part of the Ribera neighbourhood came to light. Following that discovery, the alteration work was suspended and, four years later, the Catalan government declared it to be a Cultural Asset of National Interest. Even though the site discovered at the Born represents less than 10% of ground zero, its excellent state of preservation has made it possible to recreate the life in Barcelona in 1700. Sixty dwellings have been identified, as well as streets, wells, sewers and other infrastructure. And the large number of items that have been recovered, including kitchen utensils, pieces of glass and porcelain, work tools, weapons and so on, mean it is now possible to faithfully reconstruct the everyday life of Barcelona's populace in the 17th and early 18th centuries. 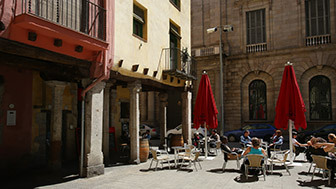 The El Born Centre de Cultura i Memòria was opened in 2013 and, as well as the archaeological site, it is a venue for exhibitions, displays, talks, concerts, shows and other events. Beyond its doors is one of most dynamic and picturesque neighbourhoods in Barcelona. People who have lived there all their lives rub shoulders with travellers passing through, hundred-year-old shops with restaurants offering contemporary cuisine, and medieval mansions with design studios. So the archaeological site shares the neighbourhood with the new trends that characterise it today. 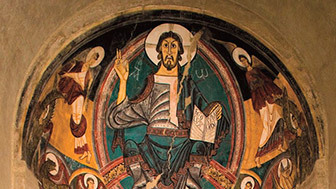 MNAC boasts an invaluable collection of Romanesque art.